First of all, how did you come up with the name for anti-hero Artemis Fowl? The name was very important. I knew it had to be a mysterious name that would make an instant impact on the reader, like Titus Groan or Hannibal Lecter. Fowl was easy enough, Fowl by name, foul by nature. But Artemis was harder. I went through several first names: Bartholemew, Bartlemy, Archimedes before I found Artemis on a Greek boys-names website. The second I saw it, I knew. 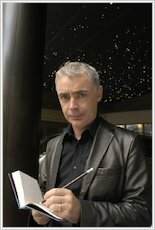 How did films and film characters influence the writing of Artemis Fowl? Films definitely had an impact on my writing style. I am a huge movie fan, and the action genre is one of my favourites. I realised that very few action movies are specifically for kids, even though kids love them. So, I decided to fill the vacuum with a book that reads like an action movie. Hopefully when you read the book, the movie will play itself in your head. Who did you base the character of feisty elf Holly Short on? Is she a reflection of the ‘girl power’ frenzy that’s swept the nation over the last few years? Holly is based on a mixture of several girls that I have taught. They are real people and refuse to conform to some idea or fad. There have always been female heroes, it’s just that male authors didn¹t want to write about them. Did you have fun playing with the Irish myths and legends in Artemis Fowl and creating a futuristic (but still very magical) fairy world? I grew up reading Irish myths and legends, so I had great fun putting a spin on them. I knew that there was no point in regurgitating other people’s stories, so instead I gave them a technological makeover. If you were given the fairy power to put up a shield (Mud People translation: making yourself invisible), where would you go and what would you do? If I were shielded, I think I would float into a few banks and erase their third world debt accounts. Either that or follow my wife and find out where she hides the biscuits. The two books on my bedside table at the moment are: Mr. X by Peter Straub and The Truth by Terry Pratchett.